Discussion in 'National Football League' started by CowboysFan, Jan 12, 2013. Peyton Manning is now 9-11 in the playoffs with 5 home losses as the 1 seed twice, 2 seed twice and a 3 seed. Peyton threw a pick 6, a fumble that led to 6 and the game clinching interception that led to the loss all the while having a 14 point cushion given to him by special teams with a heavily favored team. Manning now goes away as the choker he is. whatever makes you feel better about your hero moving to the CFL. Maybe Romo should be next to him in that photo? I mean Manning does have a superbowl ring at least. Lol, that photo was made for Romo, photoshoped it for Manning. Thanks man, I feel great. Maybe he can call Romo and get tips on how to deal with it. Its still a monster choke with a pick 6, another fumble that led to 6 and the choke city interception right at the end. ON A LOADED TEAM. Dome babby!!!!! !dome babby!!!!! !dome babby!!!!! !dome babby!!!!! !dome babby!!!!! !dome babby!!!!! !dome babby!!!!! !dome babby!!!!! !dome babby!!!!! !dome babby!!!!! !dome babby!!!!! !dome babby!!!!! !dome babby!!!!! !dome babby!!!!! !dome babby!!!!! !dome babby!!!!! !dome babby!!!!! !dome babby!!!!! !dome babby!!!!! !dome babby!!!!! !dome babby!!!!! !dome babby!!!!! !dome babby!!!!! !dome babby!!!!! !dome babby!!!!!! Loaded team? You mean the same team that Tebow was 7-4 with? But I thought the groupies weren't mad at Denver or Peyton and weren't rooting against them? Peyton's a better QB. 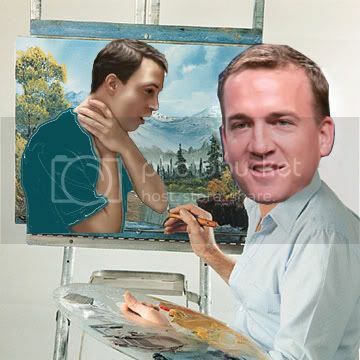 But he's a lifelong choke artist. Those postseason wins are not easy to come by -- I was disappointed by many of the Denver fans (the Tebow haters, that is) who took the achievement all too lightly and basically as their entitlement. Bottom line, everybody raises their game and tries something different in the postseason, and Tebow is to be commended for having that extra something against Pittsburgh last year. Just as New England brought it the next week. This year, the Ravens are playing with heart. How many times do people have to tell you they're not Jets fans or Broncos fans? Dude that started the thread comes right and declares Cowboy fan. By the way -- I've made that exact argument in favor of Mark Sanchez many times. I think it got him a huge bank account of leeway. It's just he may have used it up. I wanted Peyton to win...but I have to admit a certain amount of amusement that the Broncos got punked for throwing Tebow on the street after what he did for them last year, the way the Jets got punked for dumping Pennington for Favre a few years back. Even if Tebow fails and doesn't play one more game in his life Tebow>>>> most of his haters. Tell me fatso, do you even have a college degree? HAHAHAHAHAHAHAHAHAHA is this real life? No, no I don't. And he's a professional athlete, if he wasn't more successful then me at this point, then I wouldn't know what to tell you. so,tebow is a better qb than me? I said rooted for last year. There still wasn't a part of you that was attached to this team for 2 years that wanted them to succeed? That's what I mean. Like nothing carried over, it just ended once Tebow left? You must have followed the Broncos closely for two years and now people are enjoying they lost. That's what strange. I followed Kobe closely, but when they lost to OKC I was rooting for OKC but a part of me still felt bad Kobe and the Lakers lost. I leaned toward the argument he played well in the playoffs, but when you hinder your team from making the playoffs, what use is that skill? But it just shows you why we all love the playoffs, we let 1 game decide what 16 games was supposed to show us. Any given sunday works perfectly because NFL teams are so close, anything can happen. It's crazy though to pin playoff wins/losses on the QB only. I don't like when people do that becasue to be honest, how many times does the key play come to something outside of the QBs hands? So many times and that doesn't even counter the fact the QB touches the ball for 50% of the game.